The program ShowCondorIGC (SCI) supports scoring. It can load and present datas from CSV and IGC files. In case of IGC files it can filter the flightplans and check the validity (with valicon.dll from Uros). It can also calculate the points. The calculation bases upon FAI Sporting Code Annex A. 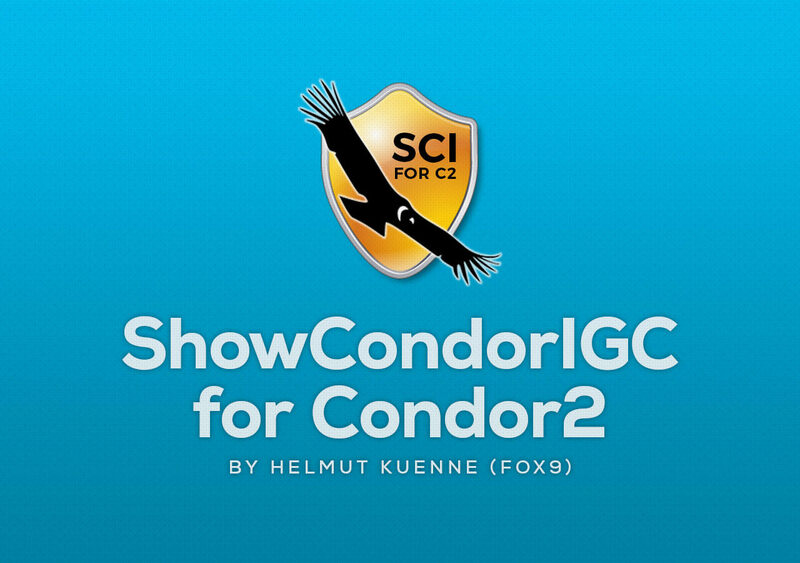 More information about SCI for Condor2 at SCIforCondor2_Readme.txt file after installation. 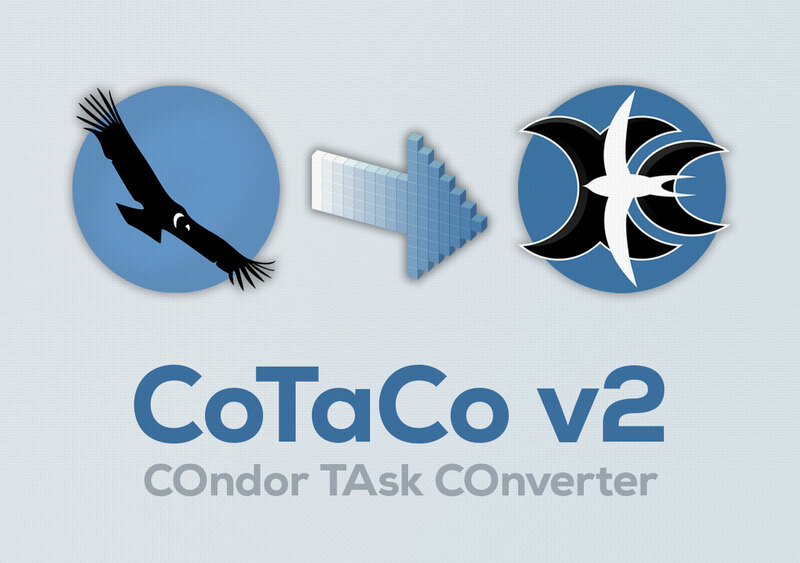 CoTaCo is a basic tool to convert Condor flight plans (.fpl) to XCSoar tasks (.tsk). It handles both Condor 1 and 2. AATs and Condor penalty zones are supported from version 2. For more informations please read README.txt file. CoTaCo je jednoduchý nástroj na konverziu Condor letového plánu (.fpl súboru) na súbor tasku pre XCSoar (.tsk). Funguje pre Condor 1 aj 2. AAT-čka a Condor-ácke zakázané priestory sú už od verzie 2 podporované. Pre viac info si prečítajne návod v súbore README.txt. 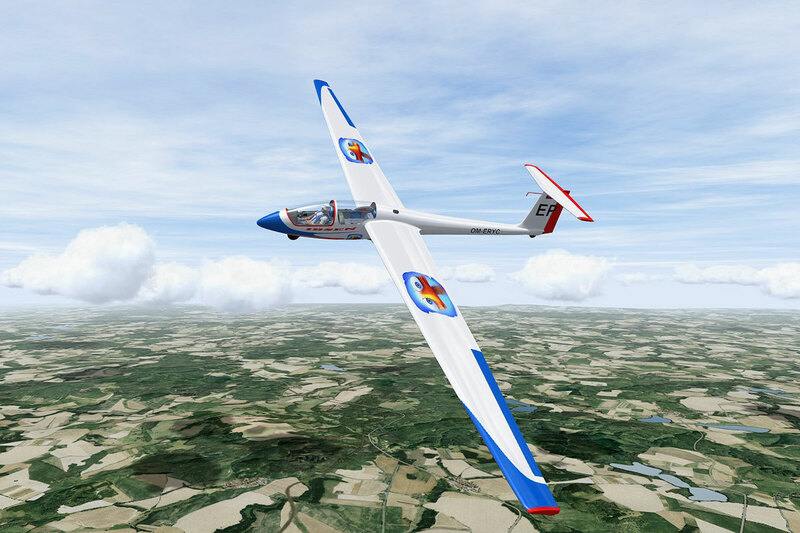 New Virtualsoaring.eu red skins for Club Class Plane Pack (PP2) are ready for you for download and 1-click install. Skins for ASG29, ASW15, ASW-19, Jantar Standard 3, Libelle and LS4. "Nový lak" pre Plane Pack 2 (klubovky) formou inštaláku repaintov vo "firemných" farbách Virtualsoaring.eu. Repainty piatich vetroňov klubovej triedy v Condore: ASW-15, ASW-19, Jantar Standard 3, Libelle a LS4. 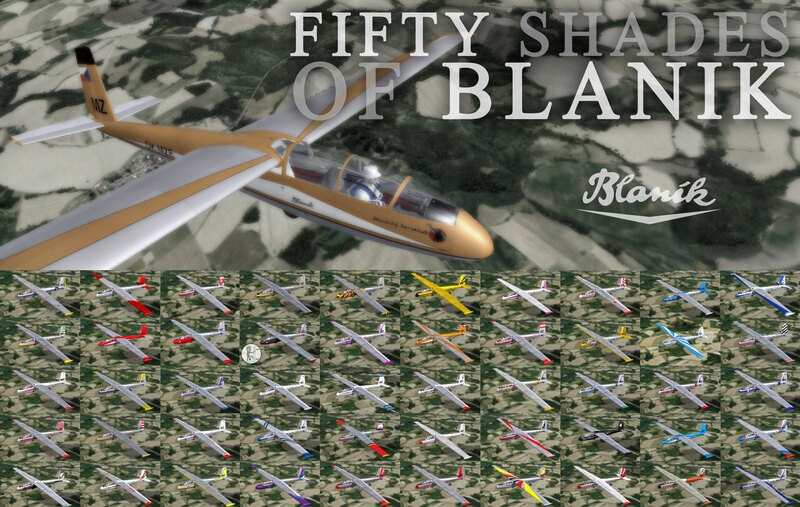 Mega collection of 50 skins for Blanik L-13 school glider for Condor V2. Mostly Czech & Slovak real-life skins plus some others. Mega kolekcia 50 skinov pre Blanik L-13 do Condora V2. Prevažne reálne skiny "blaníčkov" z Čiech a Slovenska plus zopár ďalších. 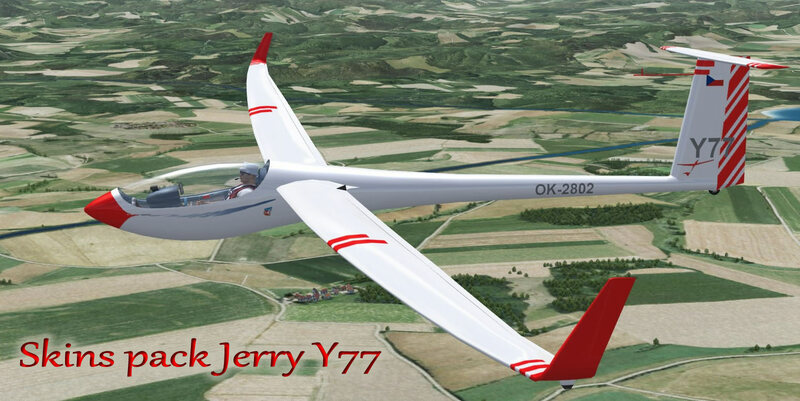 New skins by Jerry (Y77) for gliders in Condor V2. Skins for these planes: Antares18S, Diana2, Blaník, DuoDiscus, Genesis2, StdCirrus and LS8neo. "Nové laky" od Jerryho (Y77) pre klzáky do Condor V2. Skiny týchto vetroňov: Antares18S, Diana2, Blaník, DuoDiscus, Genesis2, StdCirrus a LS8neo. Ibsen Condor2 skins are ready for you for download and 1-click install. 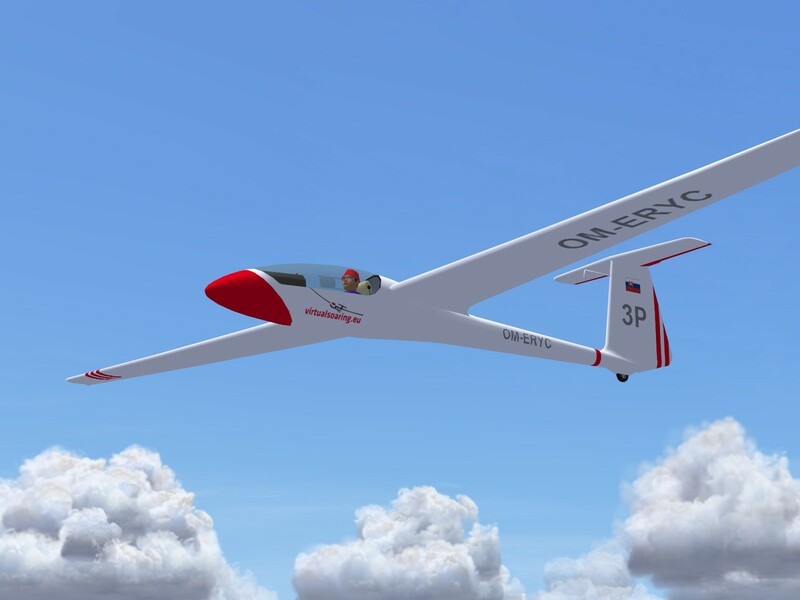 White-blue-red skins for gliders: Antares, ASK21, Blaník, Diana2, DuoDiscus, Genesis2, Grunau Baby, LS8neo, SG38, SwiftS1, StdCirrus, Ventus3. "Nové laky" od Ibsena pre Condor2 - Ibsenovky 2 - formou inštaláku repaintov. Tradičné bielo-modro-červené laky vetroňov pre: Antares, ASK21, Blaník, Diana2, DuoDiscus, Genesis2, Grunau Baby, LS8neo, SG38, SwiftS1, StdCirrus, Ventus3. Ibsen Condor skins are ready for you for download and 1-click install. Skins for ASG29, ASK13, ASW15, ASW22, ASW27, ASW28, ASW28-18, Discus2, Discus2c, Fox, Jantar2b, JantarStd3, LS10, LS4, LS6, LS8, Nimbus4, Ventus2, Ventus2cx. "Nové laky" od Ibsena - Ibsenovky - formou inštaláku repaintov. Repainty týchto vetroňov: ASG29, ASK13, ASW15, ASW22, ASW27, ASW28, ASW28-18, Discus2, Discus2c, Fox, Jantar2b, JantarStd3, LS10, LS4, LS6, LS8, Nimbus4, Ventus2, Ventus2cx. 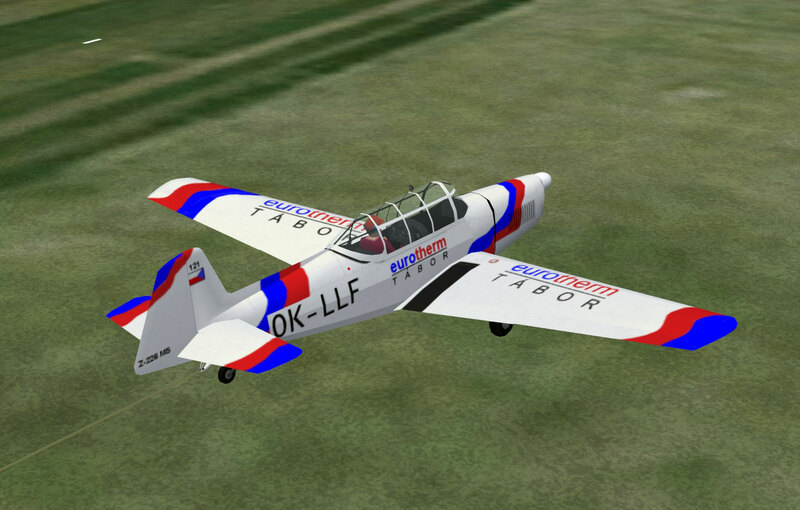 Repaints (17 pieces) of Z-226 towplane - Czech and Slovak airports: OK-KMP, OK-LMD, OK-MGM, OK-IFJ, OK-IMI, OK-KMJ, OK-KMO, OK-KNG, OK-LLF, OK-MPE, OK-MPO, OK-MQL, OM-LLV, OM-MFN, OM-MHG, OM-LLO. Also new engine sound included. 17 repaintov "dvestopäťky" z českých a slovenských letísk: OK-KMP, OK-LMD, OK-MGM, OK-IFJ, OK-IMI, OK-KMJ, OK-KMO, OK-KNG, OK-LLF, OK-MPE, OK-MPO, OK-MQL, OM-LLV, OM-MFN, OM-MHG, OM-LLO. Takisto pribalený nový zvuk motora. This modified ShowCondorIGC (SCI) add a new feature for the analyse of a flight. The pilots try to fly in rising air and to avoid sinking air. The new parameter Vmet is the average of rising and sinking air. In still air Vmet is zero. If a pilot flies along a ridge or under a cloud street Vmet should be positiv. It indicates the skill of the pilot to use rising air. 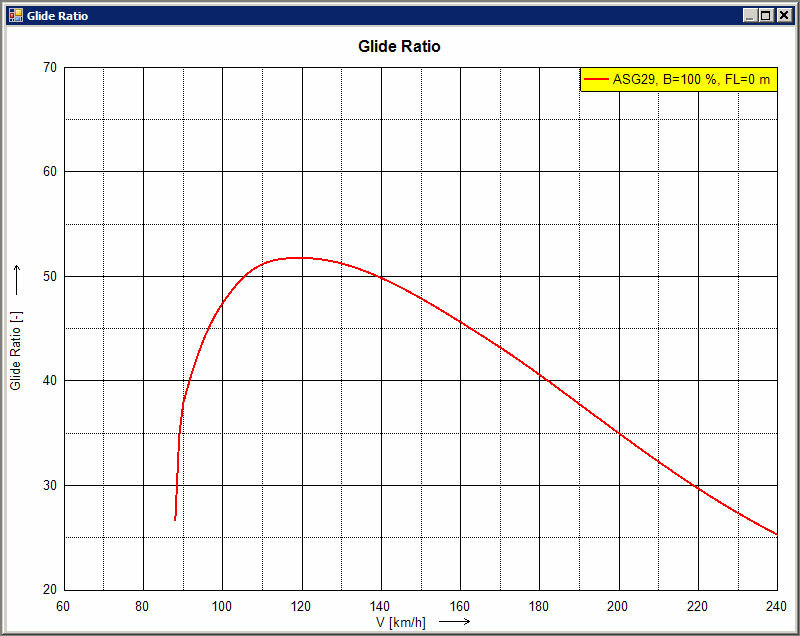 Of course you can see it also on a good gliding number, but this depends on the speed, plane type and water ballast. This makes it difficult, to compare it with other flights. The Vmet parameter shows the average of rising air independ of speed, plane type and water ballast. The program ShowCondorIGC (SCI) supports scoring. It can load and present datas from CSV and IGC files. In case of IGC files it can filter the flightplans and check the validity (with valicon.dll from Uros). It can also calculate the points. The calculation bases upon FAI Sporting Code Annex A. Official versions of ShowCondorIGC (SCI) cooperates with 32 and 64 Bit Windows. But a lot of intermediate versions with fixes some smaller bugs doesn't work with 64 Bit Windows. This update fixes the bugs and works together with 64 Bit Operating Systems. You must have installed Version 2.6. Then copy the files 'ShowCondorIGC.exe', 'SCI64.exe' and 'Planeindices.txt' into the Condor folder. CondorNav is primarily a tool to help you to plan your flight by consideration of possible paths. For this, you can set accurate altitude markers by simple mouse clicks, in passes for example. Author hope this program will be helpful, especially for beginners in on-line flights, who want to prepare their races in an efficient and playful way. 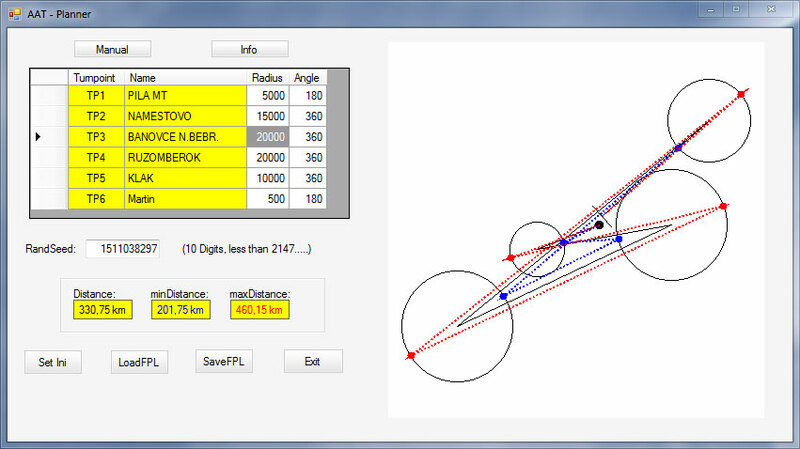 You can load a Condor flightplan, modify the radius and angle of each turnpoint and the RandSeed and save it as flightplan. If you want to create an Assigned Area Task (AAT) you must use a text editor, for the change of TP's radius. Now you can use AAT-Planner. 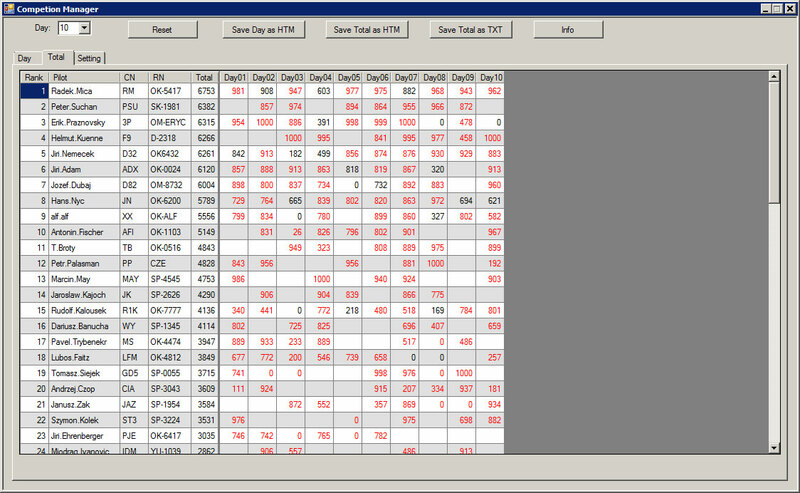 Additional AAT-Planner calculates and shows the minimal and maximal distances. 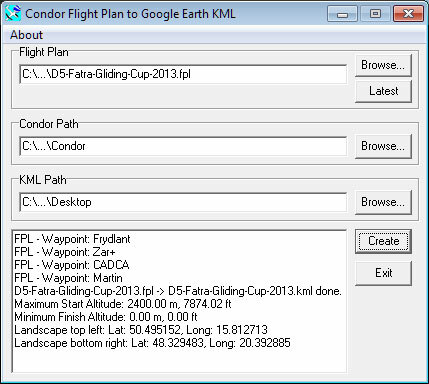 Windows software that creates a KML file for flight preparation that allows you to visualize a Condor FlightPlan in 3D using Google Earth. It needs to be on the same computer as Condor and also makes the necessary corrections for the Northern Norway scenery. Tool for conversion of IGC tracks that recorded in Condor Northern Norway scenery to real world coordinates. 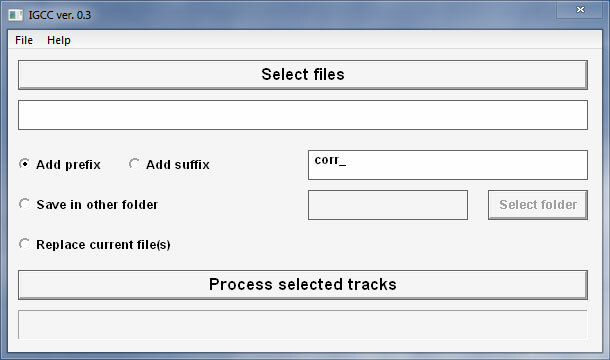 It enable to see tracks in SeeYou and similar programs. 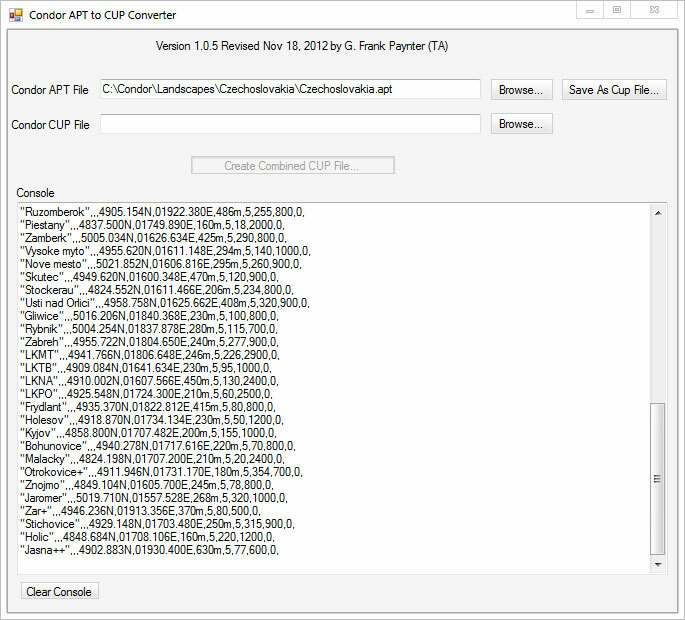 Condor CUP files (i.e. Provence2.cup) do not contain any airports, so they cannot be used directly in external PDA's for TAT/AAT tasks. 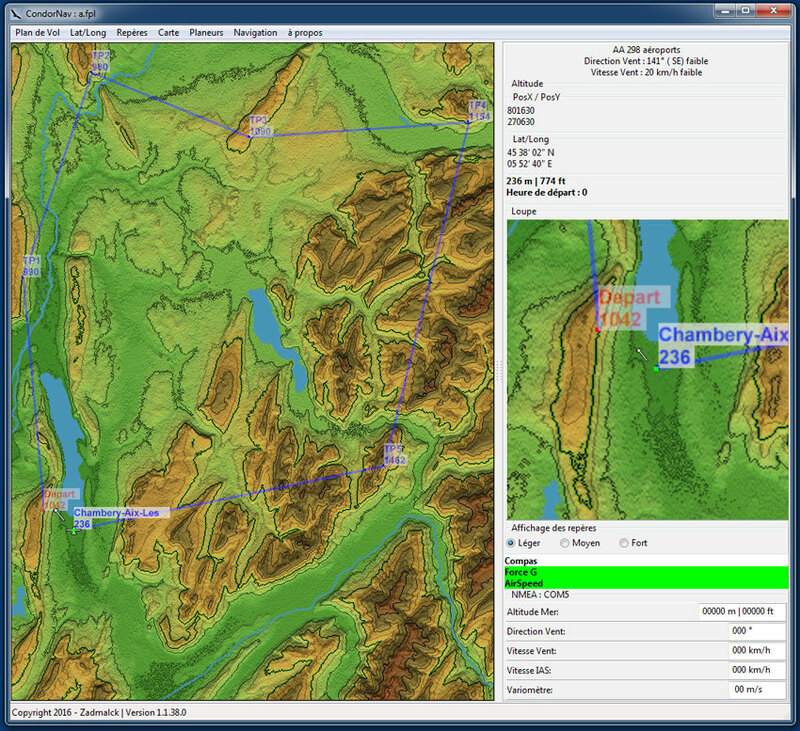 Waypoint files can be downloaded from the real-life Worldwide Turnpoint exchange, but it can be difficult to determine which (if any) real-life turnpoint file corresponds to which Condor scenery. This program extracts airport information from a scenery's .APT file (i.e. Provence2.apt) and generates .CUP-compatible data which can then be saved to a .CUP file, or combined with the waypoint data from the scenery's .CUP file into another CUP file that can then be used in an external PDA. More informations in README.TXT file in ZIP archive. CompMan is a software, which supports organizers of Condor competitions. It reads the daily results which are available as CSV files and calculates the total results. Additional the software creates HTM files of day results and total results. This program needs Microsoft .NET Framework 3.5. CompMan je softvér určený pre organizátorov súťaží v Condore. Z CSV súborov preráta celkové výsledky za daný počet dní a vie vytvoriť HTML súbor s výsledkami. Program potrebuje Microsoft .NET Framework 3.5. 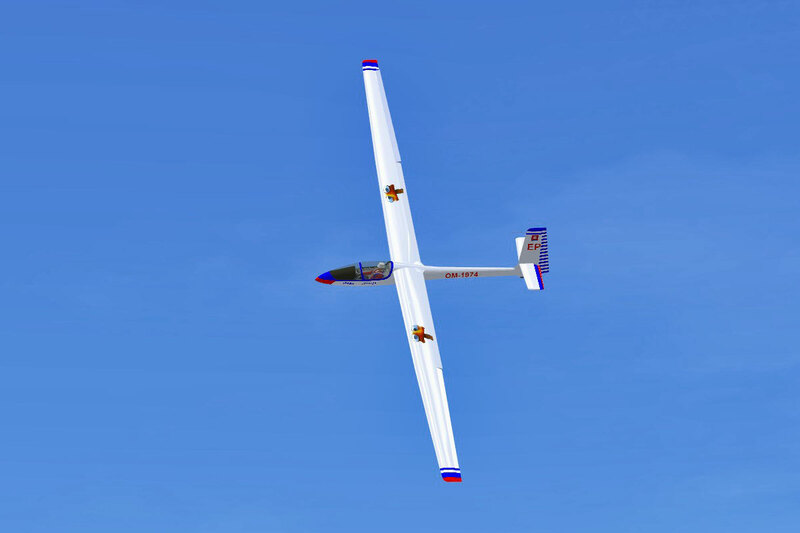 ShowGliderDat presents the datas of soaring planes. It shows a lot of diagrams and contains two tools, a ballast calculator and a flightplanner. The datas used by this program are approximations to the speed polars of the Condor flightsimulator. Version 1.5 with Club Class gliders data. ShowGliderDat je softvér na zobrazovanie jednotlivých dát vetroňov - vie zobraziť rôzne druhy grafov (speed polar, glide ratio atď.) a taktiež obsahuje dva nástroje - ballast calculator a flightplanner. Nová verzia 1.5 má už dáta aj pre klubovú triedu.